Happy Buddies provides puppy training classes in Dorking and Reigate. Puppy School is an established network of puppy training tutors. Puppy School is an established network of puppy training tutors. Puppy School courses are of the highest standard and only use kind and effective training techniques. Founder and Director of Puppy School, Gwen Bailey, set up the network in 2002 to help new owners give their puppies the best possible start in life. 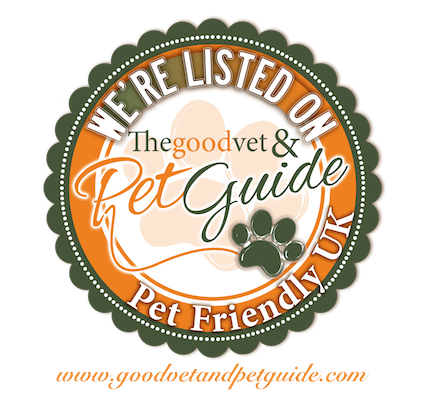 Gwen is an internationally renowned dog trainer and behaviourist who has written 9 books on animal behaviour and lectures on the subject worldwide. Happy Buddies’ Puppy School comprises of a set of 6 puppy training classes in Brockham and Reigate, lasting 1 hour each. 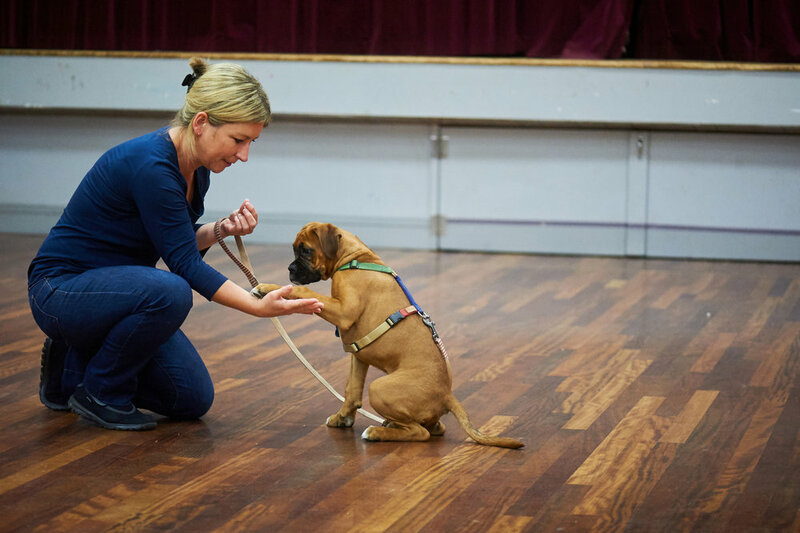 It is a comprehensive programme that will take you and your puppy through all the obedience basics, helping you to ensure your puppy becomes good-mannered, well-balanced and friendly with adults, children and other dogs whilst responding to basic commands. When you sign up to Puppy School, you'll receive a free Natures Menu Puppy Goodie box including treats, food and our informative 28 page colour Puppy School Manual containing step by step written guidance to help you practice each week. You will also receive a voucher for £15 off your first order of Natures Menu food/treats and 20% off your second order. 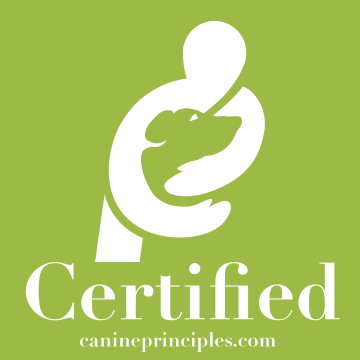 At the end of the 6 week course, you will have a solid foundation for life with your puppy. 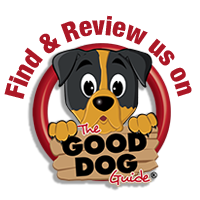 The Puppy School course is equivalent to the Kennel Club’s Foundation Certificate. Puppy School is designed for puppies aged 20 weeks or less (your puppy must have been vaccinated in order to attend class). Only reward based training methods are used at Happy Buddies and Puppy School. Treats, toys and praise are used to encourage puppies to be well behaved. No bullying or rough handling is tolerated. 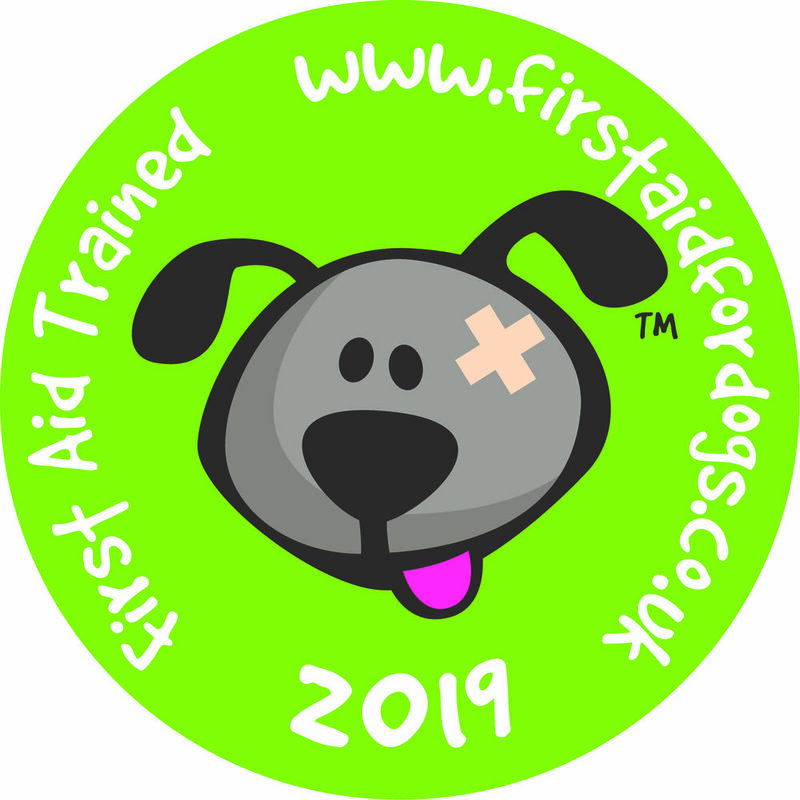 And if that isn’t enough - your puppy will receive a CERTIFICATE and ROSETTE on completion of the course! Once your puppy has completed Puppy School, they are able to further their training and advance their dog's obedience skills by enrolling onto Canine College, the follow on course to Puppy School. 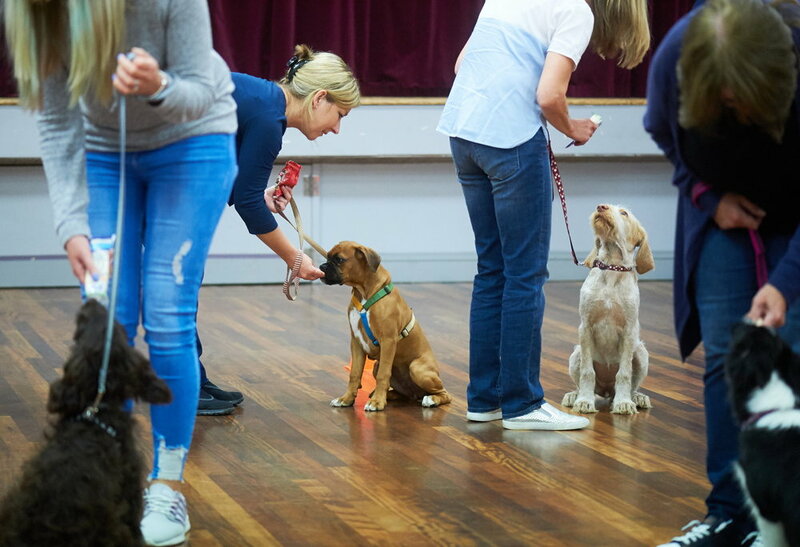 If you are unable to attend my group Puppy School Classes you may want to consider my 121 Puppy School Course which takes place at your own home at convenient times for you. The Puppy School Curriculum – What Will Your Puppy Learn? How to walk on a loose lead - without pulling! *please note we cannot guarantee the attendance of children to help socialise your puppy, but we do encourage families with children (aged 5 or over) to bring them to class to learn how to train their puppy and to interact positively with other puppies in the class. I have been chosen by Puppy School for my people-skills as well as my puppy training abilities. I will offer encouragement and praise to help you acquire the skills you need to train your puppy. No humiliation or shaming of owners will occur and all lessons are fun and sociable with a happy, friendly atmosphere! During my puppy training classes, your puppy will be allowed to play with other puppies in carefully controlled small groups, to ensure they learn good manners around other puppies, do not get scared and do not learn to play roughly or aggressively. I will match puppies for size, age and experience and play will be carefully supervised to ensure that all puppies learn to be confident with others. Please note that in some cases, the mix of puppies may make it impossible to conduct puppy play sessions safely. Puppy play sessions will only be offered if they can be run without causing harm. 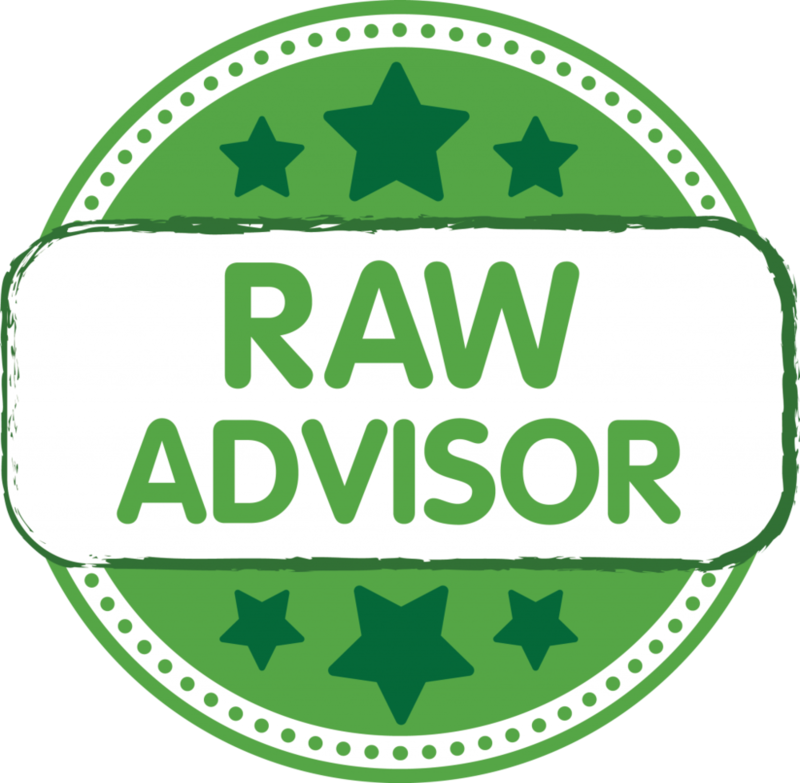 Throughout the course, I will be on hand to help you with any behaviour problems. Although I will provide you with all the information you will need to train your puppy in class, you will need to set aside time every day to practice the exercises at home to make the most of the ideas you have been given. Training at home will allow you to progress further in class and will result in a better trained puppy at the end of the 6 weeks. My puppy training classes are monitored regularly to ensure I maintain my high standards. I have been well trained in the latest training techniques, as well as in human and animal behaviour. I attend regular refresher courses and have the benefit of an email forum which all Puppy School Tutors can use to ensure we stay up-to-date.